The ornamental pond in the corner of the garden at the Hazuki residence is an oasis of tranquility. 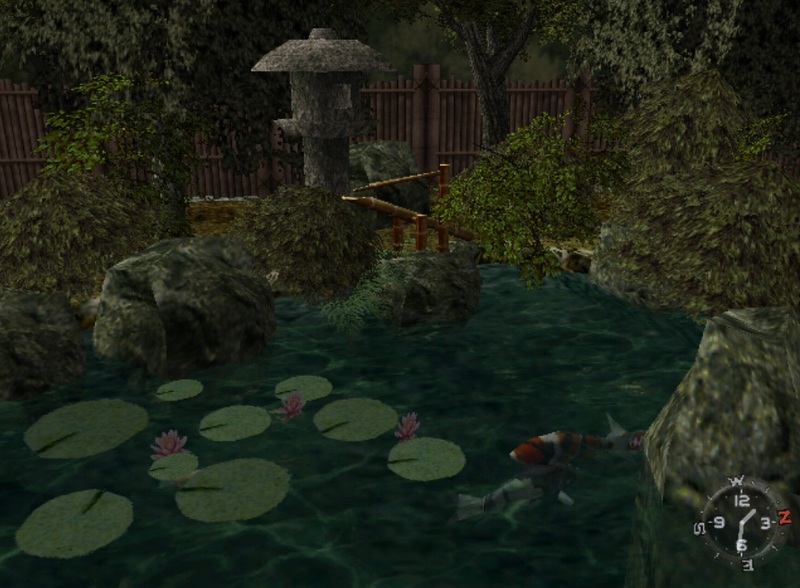 Flowering water lilies bob gently on the surface, rising and falling as Japanese carp glide lazily by underneath. Birds twitter in the trees and the water trickles continuously into a bamboo water fountain. Time stands still at the scenic garden pond. Every so often, the bamboo spout of the fountain pivots over, spilling its collected water into the pond, and makes a distinctive "clonk" as it returns to its original position. The sound can be heard from other parts of the garden as Ryo walks around. Let's look at how the fountain works, what its name is in Japanese and finally some in-game footage of the fountain in motion. The fountain consists of a bamboo tube, open at one end, that pivots at a point set off from the center so that the heavy end rests on a carefully-positioned stone when the tube is empty. Water feeds into the top of the fountain through a narrow bamboo pipe to one side. 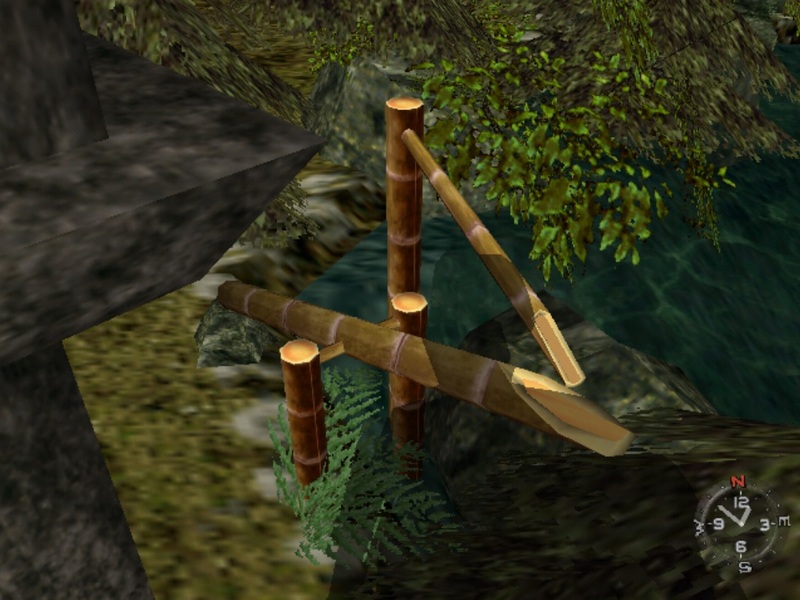 The bamboo fountain at rest: the low end sits on a stone. The design makes use of the fact that bamboo has natural internal partitions, so that when water flows in to the open end, it will fill only the upper-most couple of sections. The added weight of the water will eventually cause the tube to tip over, divulge its contents and then fall back down. The sound of the heavy end of the bamboo tube striking the stone after it does so is what makes the distinctive thud. This style of fountain is often a feature of Japanese ornamental gardens. It is known in Japanese as a shishi-odoshi, meaning "deer scarer", which is also a more general term used to refer to contraptions such as this that make a sound to frighten animals away from vegetable patches or crops. A more specific name for bamboo water fountains of this design is sōzu. The concept is that the sound they make will startle away any animals grazing nearby and prevent the plants in the garden from being nibbled. I find the rhythmic sound of the fountain to be quite relaxing, almost hypnotic. Here is a video of some footage I recorded of the fountain and pond to enjoy. You may notice that the angle is different from the one Ryo normally has when he walks outside - I used a small hack to allow Ryo to walk to the other side of pond since it gives a better view. (Also, it was only on closer examination that I realized that the water entering and leaving the fountain is not actually rendered in the game!). 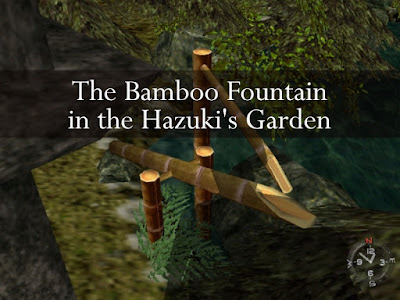 What did you think of the fountain when you first discovered it in Shenmue? Leave your thoughts below! Ah, I can see how that could happen! 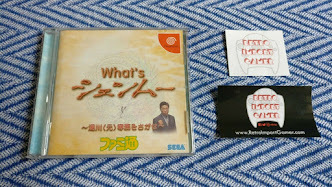 It integrates so well into the music as Ryo walks around the garden. Your website deserves a forum Switch! I love the dojo... but the owner Yama seems not to get so evolved and passionate as the rest os the users. 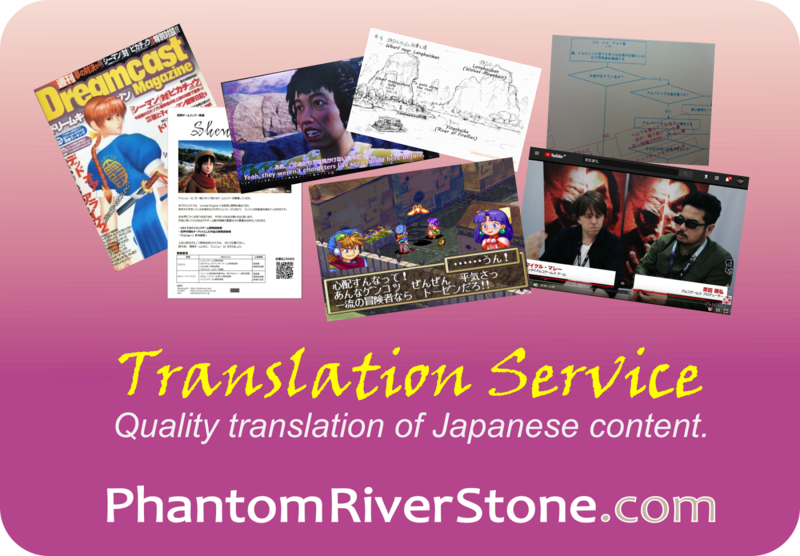 You do an excellent work, and the phantom river stone can be a second place for us. Anyway, thank's for all your effort translating all the news who came from occident and always bring curiosities for us. Sorry my english, I'm Brazilian. You're welcome, thanks for the kind words! 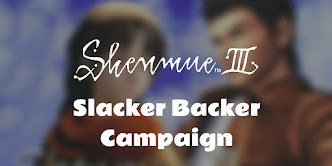 My aim with this blog was to complement the existing sites and give a fresh perspective by highlighting things that might not be obvious for overseas fans, so I'm very glad you're enjoying it.